Providing unbeatable scenery on land and water, bike and boat tours have become a popular choice for couples, families and groups of friends looking for enriching vacation options in Europe and beyond. BikeToursDirect will expand its bike and boat tour offerings to more than 60 tours in 16 countries for the 2012 season to accommodate growing demand for this unique travel experience. BikeToursDirect offers bike and boat tours in 14 European countries, Vietnam, and the islands of Seychelles, and each tour presents a unique boat experience, ranging from small vessels holding fewer than 25 people (barges, schooners, yachts or converted fishing boats) to small passenger boats holding up to 150 people. For many, being on a small boat is the biggest appeal of a bike and boat tour because, unlike large cruise ships, they don’t have to worry about crowds or making a connection. Cycle tourists also enjoy meeting people from several countries and seeing a variety of landscapes and places: countryside, islands, mountains, villages and towns. · Loire Valley (France), which spotlights the most peaceful part of the Loire Valley, passing through vineyards, chateaux, quiet villages and medieval towns. · Venice to Mantua (Italy), which winds along the Mincio and Po rivers through rural, pristine areas of the Italian countryside, ending in the Venetian Lagoon with a full day to explore Venice. · Holland, Northern Tour, which follows the North Sea coast and several canals through marshland, picturesque villages and historic harbor towns. · National Parks of Dalmatia (Croatia), which highlights romantic ruins, charming hills, countless natural phenomena, two national parks and the islands of Central Dalmatia. · Danube Bike Path (Germany and Austria), which runs along well-signed, dedicated, nearly flat bike paths through vineyards and medieval towns, taking travelers from Passau, Germany, to Vienna. Based on nearly a decade of success with European bicycle tour offerings, U.S.-based BikeToursDirect will add tours in at least 10 new countries on four continents for the 2012 season, including tours in New Zealand, South Africa, Vietnam, Thailand, Mexico and Jordan. BikeToursDirect currently represents over 50 local bicycle tour companies, primarily in Europe, and offers more than 200 tours on its website, www.biketoursdirect.com. Some “test” tours offered in 2011 that will continue and expand in 2012 include “South African Cycle Safari,” which travels along the Cape peninsula through private game reserves, where cyclists can see lions, elephants, leopards, rhinos and other wildlife; bicycle tours in New Zealand, which explore rainforests, glaciers, mountains, islands and more; and four tours in Vietnam, including a two-week bike and boat adventure that explores bustling cities and rural districts. Soon to be added: a Riviera Maya Bike Adventure in Mexico that takes cyclists across the Yucatan peninsula from the jungle to the Caribbean. Some of these new tours are offered year-round, providing greater flexibility for travel planning. Unlike many companies, BikeToursDirect doesn’t operate tours but instead represents overseas companies. Local tour companies can keep their tour prices down due to the lower cost of doing business close to home and to spreading their expenses over a large client base. Clients book tours and make all payments through BikeToursDirect, usually at the same prices charged by the tour companies. The full roster of new tours for 2012 will be unveiled in November when BikeToursDirect launches a new website. Although 2012 information on existing tours won’t be added until the new site launches, BikeToursDirect already has details on many tours. If you’re eager to book a tour now—or just want to start planning—feel free to contact one of BikeToursDirect’s tour experts about 2012 tours. 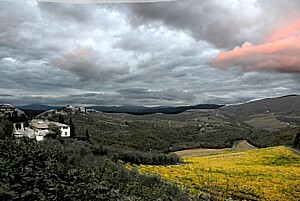 Visit www.biketoursdirect.com to complete an inquiry form or call 1-877-462-2423 (toll-free) or 1-423-756-8907 (local and international). Spain's environmentally-friendly ‘Vías Verdes’ Trails take you on a spectacular journey through the countryside. Here, the Via Verde de la Sierra (Cadiz-Sevilla). A recognized leader in eco-tourism and sustainable development, Spain continues its efforts to promote ‘greener’ ways to travel with the help of the Vías Verdes Program. The program, translated literally as greenways, encompasses re-purposing and redesign of unused railway lines into trails for walkers, joggers and cyclists. Similar to Manhattan’s High Line or the Illinois Prairie Path, Spain’s Vías Verdes added over 1,110 miles of trail passages to those existing in Spain naturally. The trails, located throughout the country, vary in length, providing an option for travelers in search of an active outdoor challenge or those looking for a leisurely stroll. 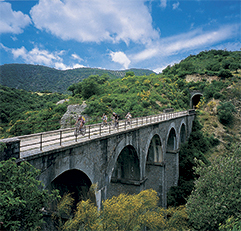 From the 1-mile long Paseo Itsaslur Greenway in Bizkaia that offers breathtaking views of the Basque Country shoreline, to the 46-mile long Sierra de Alcaraz Greenway in Albacete (Castilla La Mancha region,) that will take you through parts of the Don Quixote Route and the meadows of the rivers Jardín and Cubillo. The flat and even surface of Vías Verdes assures seamless travel for those on foot or a bike. Conveniently located near major cities or in close proximity to train stations, the greenways present an opportunity to discover Spain’s hidden corners, admire the pristine beauty of its landscape as well as interact with the country’s habitat. Recently, the Spanish Railway Foundation in collaboration with the Biodiversity Foundation and Ferrovial, one of the world’s leading developers of transport infrastructure, launched a campaign titled “Greenways, Zero CO2” to emphasize the environmentally-friendly facet of such programs as the Vías Verdes. The campaign, set to finish at the end of October, 2011, stresses the need for the development of alternative, non-motorized infrastructure options to reduce CO2 emissions, promote sustainable patterns of mobility and preserve biodiversity. With over 80 itineraries available on the program’s website, every traveler will find a greenway to best suit their interest. For more information on the Vías Verdes Program, please visit http://www.viasverdes.com/GreenWays. For more information or questions on travel to Spain, visit www.spain.info or contact the Tourist Office of Spain in New York at nuevayork@tourspain.es.